If you thought that after going back to Aaron, Sara, our Sara, was going to achieve peace and serenity, you don’t know her or that b**** karma very well at all. At the beginning of this novel, Sara is living a fairy tale: an exciting job, a passionate husband and a child on the way. But even with that winning hand, is she happy? That’s a rhetorical question if ever there was one: Sara will find any way she can to torture herself, it’s her greatest talent! Laura Norton wasn’t just the publishing revelation of 2014 with No culpes al karma de lo que te pasa por gilipollas (Don’t Blame Karma for Acting Like an Idiot), two years and 30 editions later she is still on the bestseller lists (150,000 copies sold). 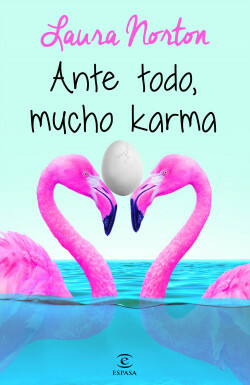 The launch of her third novel will follow the release of a film based on No culpes al karma, starring Verónica Echegui.